Dwell by Cheryl: "Blog Following 101: Leaving a Comment"
My birthday week is off to a great start! I had an opportunity to visit the Art Institute of Chicago on Monday and I can't wait to tell you more about it. In the meantime, I'm excited to announce that later this week I'll be featuring my first official blogger guest post. Jennifer of Pure and Simple Organizing will be sharing some great ideas for closet organization. You guys enjoyed "Closet Eye Candy" so much that I thought it would be a nice follow-up. But first, because we'd like to give our guest blogger some great feedback, I want to make sure that everyone is familiar with how to actually leave a comment. I've heard that many of you are still not able to figure out how to leave a comment. Not to mention the fact that I receive far more replies to blog feed emails with feedback than I do comments on the site. 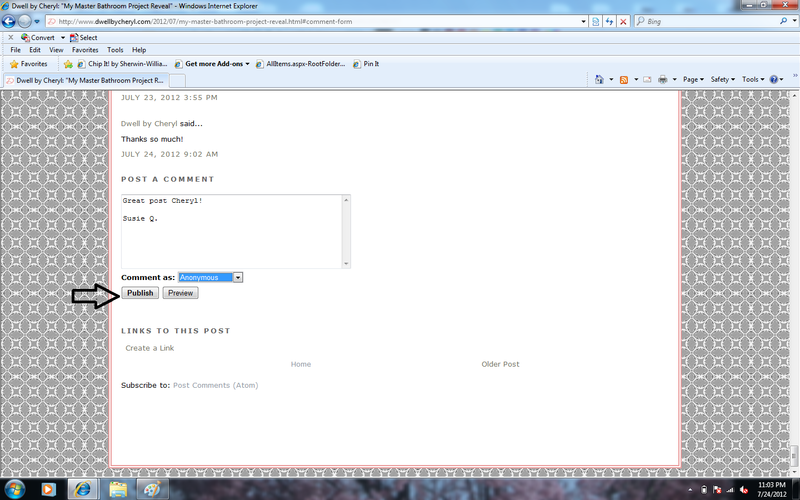 Just so you know, it's always best to leave a comment on the site. Potential sponsors will want to see that I, not only have a solid following, but that I'm also interacting with them on a regular basis. Comments provide great "public" feedback to my blog post as well. They also inspire others to leave comments. So, don't be shy I LOVE hearing what you think, or how you'll use the info, or projects you've done, etc. 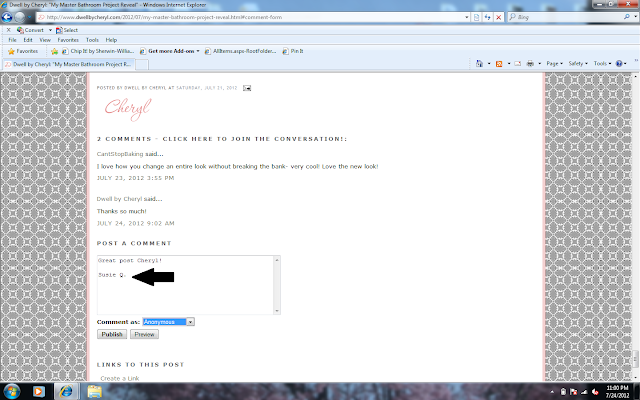 So since we already established how to "Be a Follower", I thought I'd show you today how to leave a comment. 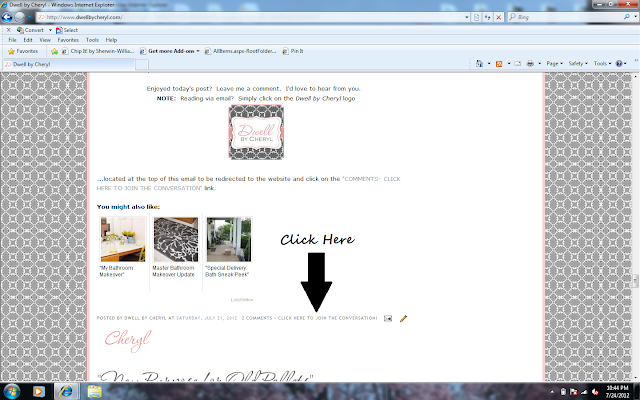 First, If you're reading the post via email (not on the www.dwellbycheryl.com website), you'll need to click on the logo at the top of the email. It looks like this. Then, you'll notice that beneath each post, just before my signature is a line that indicates, "Click Here to Join the Conversation". 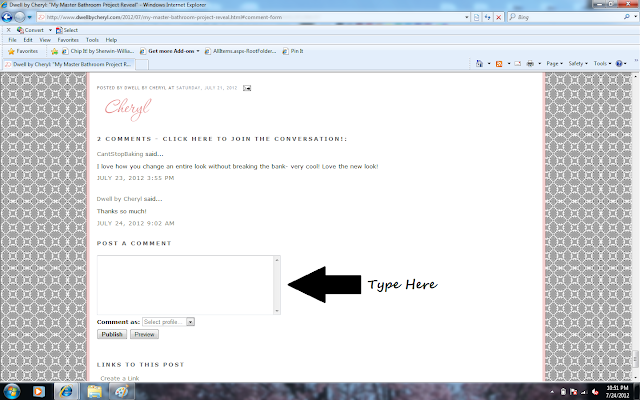 Once you're on the site, be sure you are just beneath the day's post that you want to comment. There is more than one on the site at a time. Simply click on those words and a dialogue box will open. Next you'll need to identify who the comment is from. You do this by clicking on the drop down list just beneath the dialogue box. For the novices out there, the easiest thing to do is just select "Anonymous". 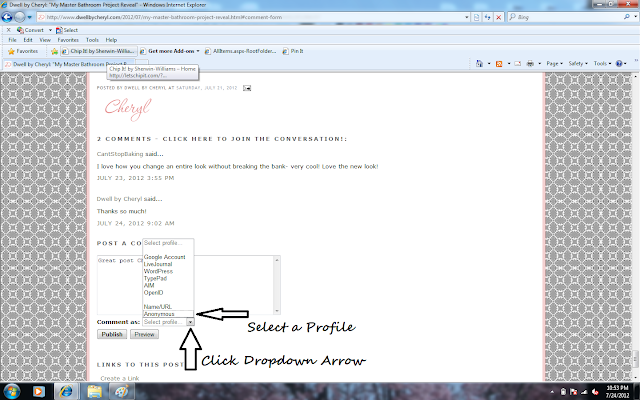 Be sure to go down to the last profile option listed (may require you to scroll down the list). If you have a Google Account and you're signed in, your name/id will appear as the first option and your comment will read, "__________ said....."
That's it, just hit Publish. See, it's not that hard. So go ahead and try it out. I look forward to hearing from you guys. Jennifer, totally excited about introducing you to the clan! They're going to love your tips. Thanks so much! I began on January 1st of this year. Thanks for reading. I love reading your posts. Great job guys. Keep writing for more! Very nice blog , really amazing to read and watch. Content and words are really interesting and thanks very much for this type of blog which imparts beautifully how to comment in a blog. Thank you for sharing this insightful blog. Nice blog thanks for sharing and Happy Birthday! You’re so proper. I’m there with you. Your blog is sure worth a have if anyone comes throughout it. I’m serendipitous I did because now I’ve got a integral new content of this. I didn’t create that this takings was so distinguished and so coupler. You definitely put it in perspective for me. It's more than enough to say that everyone wants something more like the ones who do it. More than half of the businesses who deal with those remodeling ideas and so could really say how things are and what it takes to make something so amazing and something so awesome in a way..because you make people happy in some way, and even the big names like KSA Kitchen Remodels and www.usaaconstruction.com agreed.